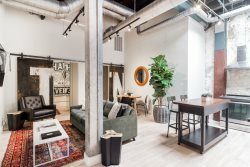 Anchor Rentals is the sole management company for 506 Lofts. We are a family owned Vacation Rental Management company that is dedicated to providing excellent customer service and treating every property like our own. We have been awarded Superhost status 6 consecutive times and we couldn't be more grateful! Members of our management team are on-call 7-days-a-week to respond to calls and answer questions! Our housekeeping company employs a team of qualified housekeepers to give each unit the individual attention required to maintain a rental property in top notch condition. With their professional laundry services, linens are inspected with each wash to maintain quality. Our website receives high marks for ease of navigation. With our on-line program, potential vacationers can book 24-hours-a-day!